Blew off another vet appointment this morning. I'm still having trouble getting out of bed early, even if it's for something important. And having Peanut spayed and vaccinated certainly is important. My sincere apologies to the Animal Birth Control Clinic in Waco for not showing up to my/Peanut's appointment. But your loss is Coryell Vet Clinic's gain, because they can get me in tomorrow. I'll pay more, but that's the penalty for missing the ABCC appointment today. This also means that I won't be doing any of the things I was planning to do today: grocery shopping, renewing my driver's license; having a free oil change. I put a real nice comment on the Facebook page of the Chevy dealership that fixed my car for free the other day. They then thanked me for the kind words by offering me a free oil change! Stanley AutoGroup in Gatesville! I won't be getting any cream for my white russian, either. I "dispersed" nematodes last night. Started when the sun went down so it would be relatively cool. I have no idea if they were alive, or if they're going to be effective, so we'll see. I only used half, and I offered the other half to my neighbor. She said she'd take them. So I ended up sleeping until noon. Don't know how I'll handle tomorrow's appointment. The most effective way for me to get to an early appointment is to stay up all night. Of course, it's best if I sleep all day and get up in the late afternoon. Otherwise, I'll be very, very sleepy by 7:30 AM. But I will get there. I have to. No more kittens for me!!! Oh, hey! 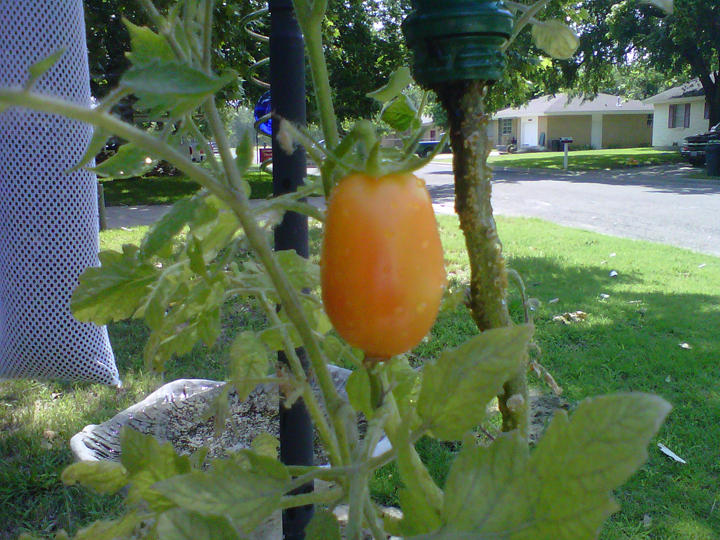 My tomato is almost ready to be picked. I tried to grow a tomato plant upside down, doing something I saw on the Internet. It worked, but I only got one tomato. And it's almost red enough to eat. One more day, maybe. Here are some pix from about a week ago. The upside down soda bottle was the idea I saw on the Internet. 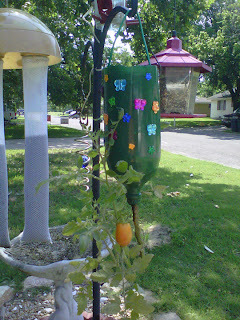 Originally I had it hanging where it didn't get a lot of sun, and that may be why I only got one tomato. I've since moved it to the shephard's hook you see in the photo, and now it get a lot more sun. I'm going to get some stuff that's sprayed on tomato plants that is supposed to make them grow more tomatoes. We'll see. First I have to see if I can find some. This is a "roma" tomato. They're smaller than your standard, garden-variety tomato, but darn they're good! If you haven't tried them, I strongly recommend that you do. I usually read my blog posts a couple of times to make sure there are no typos. I haven't been doing that. My apologies if you have found any. I think that's all for now. I hope you have a great day!! !